Choose between the dolls below and print out onto paper or light printer card. Colour (if appropriate) and cut out the dolls carefully. Now print out the two pages of the body template below and cut out. We used scrap paper but you could use coloured printer paper or light card. Lightly spread the bottom half of each doll with glue stick - from the widest part of their body down. Match the dolls up with the appropriate strips of paper, and place them in the centre of the strip, so that the bottom edge of their body touches the bottom of the strip. When dry, circle the strip and fasten at the back, allowing a centimetre overlap. Glue or staple. Your dolls are ready to stack! 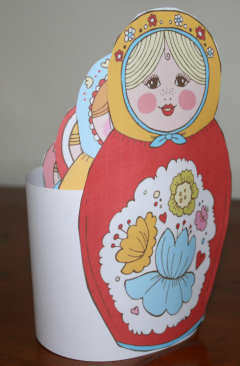 Dymkovo toys, also known as Vyatka toys or Kirov toys, are a traditional Russian folk art handicraft made by woman. They are moulded and painted clay figures of people and animals. Try your hand at making your own! Lacquerware painting has been traditional in Russia for centuries. Papier mache boxes and panels were lacquered and painted with intricate designs and scenes from folk tales.